MoonProject – Did Klaus Fuchs open the Iron Curtain to The Cold War? You are here: Home » Featured » Did Klaus Fuchs open the Iron Curtain to The Cold War? Did Klaus Fuchs open the Iron Curtain to The Cold War? The conviction of Emile Julius Klaus Fuchs in 1950 as a spy was a shock to those around him, but the extent of his espionage was to send shock waves around the world in terms of the impact it had upon the balance of power in the world for the next 30 years. 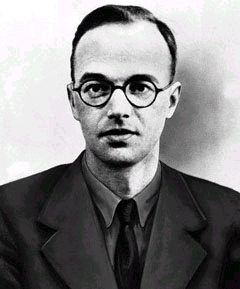 Klaus Fuchs had been a theoretical physicist at the Los Alamos Laboratory and worked within the ‘Manhattan Project’ developing the theoretical calculations of the first nuclear weapons and the early models of the hydrogen bomb. After the Second World War his knowledge and experience led him to the Atomic Energy Research Establishment at Harwell as the head of The Theoretical Physics Department under the directorship of Sir John Cockcroft. Fuchs had escaped Germany in the early 1930’s after the Reichstag fire as he had been a member of the Social Democratic Party. He chose to speak for the communist candidate during the elections in direct opposition to the Nazi party candidate leading to Fuchs being beaten up and thrown in the river. He realised it was time to leave Germany. It is clear that Fuchs developed ideologies which were to shape his thinking throughout the rest of his life and give his reasoning for his espionage in later life. Fuchs later testified that he passed detailed information on the project to the Soviet Union through a courier in 1945, and further information about the hydrogen bomb in 1946 and 1947. This was the information that was passed from the ‘Manhattan Project’ which hastened the Russians developing their own nuclear weapon. Fuchs was party to many of the developments that occurred during this period and the information he passed was clearly important to the Russians, but how important remains in debate. The Soviets will testify that they were further on with their developments than the West believed, but this can be seen as Cold War rhetoric and the fact that they had an elaborate system of passing information in itself suggests that they needed help in certain aspects of their nuclear development. As Fuchs was their only real mole inside the Los Alamos Laboratory the importance of his information must not be under estimated. Also the fact that the Russian’s exploded their first nuclear device in 1949 after a change of direction in policy in 1948 suggests that information had been obtained that hastened their own nuclear project. Without this information the Russian weapon would have taken much longer to be developed and the subsequent realisation at the end of the Cold War that they had far less nuclear capability than the west believed adds fuel to the notion that Fuchs passed crucial information at the crucial times to develop the Russian capability. However, it is clear that Fuchs information had no bearing of the development of a hydrogen bomb in Russia as he did not have sufficient information to help develop this. Fuchs confessed fully in January 1950 and was convicted on March 1, 1950, and sentenced to 14 years in prison. His testimony to British and American intelligence agencies eventually led to the trials of David Greenglass and Julius and Ethel Rosenberg in the U.S. The cat and mouse of the Cold War over the next 35 years was due to the mutual understanding that the Western powers and the Soviets had a nuclear capability that could wipe out the Earth. The rhetoric, bluffs and counter bluffs were all due to the fact that no one power had that capability. In that knowledge, the importance of Fuchs passing information through espionage cannot be under-estimated in the escalation of the Cold War.